Did you know Lichens are good indicators of air quality? Lichens are especially sensitive to some important pollutants. With only a little lichen knowledge (and our free Android App) you can gain insight into your local air quality as well as add useful information to a growing database on air quality and environmental pollution. Mapping and monitoring types and quantities of lichen is important to understanding air quality and the impact air pollution has on life on earth. There are two ways you can participate: use the Android App to log in your observations with your smart phone, or take field notes and later input your data directly into our website. Lichens are basically fungi with a photosynthetic partner. In other words, they are two (and sometimes three) life forms in one. Because they get most of their mineral nutrients directly from the atmosphere rather than soil they are especially sensitive to air pollution. How are lichens useful indicators of air quality? Some lichens are very sensitive to low levels of air pollution while others can tolerate quite a lot of pollution. A careful observer can assess air quality by what kinds (or species) of lichens are present at any site. How do I learn to use lichens to monitor air quality? How do I learn to use lichens to monitor air quality? Lichens come in a fascinating variety of shapes, sizes and colors. If you have a hand lens or magnifying glass, or even just good eyesight, with the help of our tutorials ( novice or intermediate ) you can learn to recognize indicator species and record their abundance. The application will do the rest. With this app you can use lichen indicators—developed to monitor air quality in our national forests and parks—to evaluate air quality in your own backyard. 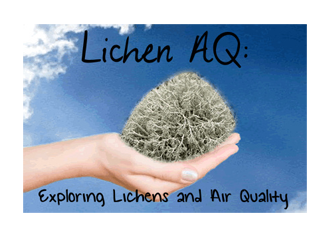 The Lichen AQ android application allows citizen scientists to evaluate air quality at any site with at least 10 trees in western Oregon and Washington, northwest California, coastal British Columbia and Southeast Alaska.